Steve Nash is a great teammate to have. Not only is he a two-time MVP who scores a lot of points, he also helps his teammates score with assists. An assist is when you pass the ball to your teammate and then your teammate scores. Steve is an excellent passer. He can get the ball to his teammates at just the right moment, even if it means throwing the ball with one arm or while he’s looking the other way. At a recent practice, we met up with Steve and asked him to explain why “dime,” which is a coin worth 10 cents, is a common slang term for an assist in basketball. We also talked about the charity work he does to assist people around the world. Jason: Welcome to English, baby! I am Jason here with Steve Nash. Could you tell us how you would use the term “dime”? Nash: Dime. Yeah. You usually say that you dropped a dime. I’m guessing the origin came from in the old days when you needed to use the pay phone to make a phone call. It cost a dime, so you dropped a dime, or gave somebody a dime, so they could make their phone call. It’s an assist. Jason: Perfect. In addition to assists, you like to assist. You do a lot of charity work and you’ve done some in China too. You have a shoe in China. Did you sign with a Chinese shoe company as part of your charity goals? Nash: A little bit. I’ve done some things with Yao Ming, a couple of charity games, and we built some schools in rural China and other areas as well and in the earthquake zone. I’ve been fortunate enough to go to China three or four times now and help out. My shoe contract and my partnership with Luyou is definitely one where we’ve gone and dedicated courts and created opportunities for kids in some of the rural areas or areas where they don’t have the opportunity to play basketball, you know, different resources whether it be basketball courts or sporting equipment or money. Nash: English, baby! That was pretty awesome. Steve is a great passer, so he makes a lot of assists on the court. But he also assists people outside of basketball. He’s involved in several different charities. He even does some charity work in China with Yao Ming. He’s helped build schools and basketball courts in poor and rural areas. Have you ever assisted with a charity? What was the last time you assisted someone, in sports or in regular life? Nash is definitely an excellent basketball player! Way to go!! It is really fantastic to be a good doer. i like the way he lives, helping others is remarkable .i admire you nash. wish you luck in your new team lakers ! Well, though basketball is not that popular in Canada, I’ve always been fascinated with the game’s technique like dribbling behind the back, making blind passes, spinning the ball on the finger, slam -dunk and all that stuff. And Steve Nash is a great man. I like him just the way he said, “English Baby”. It was like “no look pass”. I bet Jason didn’t expect it! It’s my fav. part of the dialogue. I can imagine if Bono was interviewed and asked to say “English Baby”. First there would be a crowd of people, then I think he would spread his hands up and put the “English, Baby” words into lyrics. About Steve Nash charity, I think he walks the walk, like Warren Buffet who keeps donating to Bill Gate’s foundation and whose plan is to donate in there 99% of his income. It’s worth of much respect. so hop to make them littel slowly. I play basketball in school sometimes, even I’m not a good player but I have ever assisted a charity for my friends, I allowed them to score. It was kind of fun and it’s part of the game, we are one team and work for team. helping others can make you happy…and when you need any help you will find alot of honest people around you..they will be happy to help you not for your money or any thing else just for your good heart.. In fact, it’s a wonderful thing to help other people especially who really need the basic needs to hardly live a normal life, i think we should save some time to do any help and after that our happiness will be even more than the people who need help. Great player. Great charity. Great dime to help rural kids. LIKE In court, he is dropping a dime in reality. Actually some times we didn’t have an opportunity to select some thing IN our lives . I have been fortunate enough to choose my work Just . 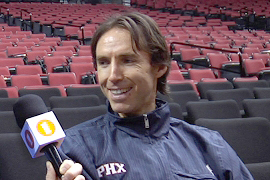 I know steve nash . He is a great player ,He has a lot of skills . I don’t know what this exercies means .